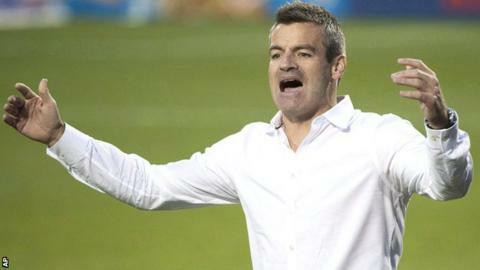 Former Blackburn defender Ryan Nelsen has been sacked as head coach of Major League Soccer side Toronto. The 36-year-old, who also played briefly for Tottenham, left QPR to become Toronto coach in January 2013. Former Spurs team-mate Jermain Defoe joined in January, and United States midfielder Michael Bradley also signed. A 3-0 defeat by New England Revolution last weekend leaves Toronto in fourth place, 13 points behind leaders DC United with two games in hand. Nelsen's comments about Toronto general manager Tim Bezbatchenko after Saturday's defeat may have contributed to his departure. He was unhappy with Bezbatchenko telling the team to "take it up a notch", claiming his players were being put under undue pressure. "Those comments (Nelsen made) were excuses, and we are not in the excuse business," Bezbatchenko said in announcing Nelsen's departure. Greg Vanney, a former United States international who was serving as the club's assistant general manager, will take over, the club said.